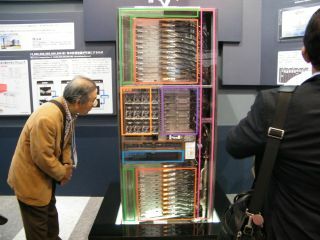 The rankings of the top 500 supercomputers on the planet have been updated, with the University of Edinburgh's Cray the UK's only entry in the top 50 of a list topped by Japan's Fujitsu K computer. The list – assembled by the University of Mannheim in Germany, the Lawrence Berkeley National Laboratory in California and the University of Tennessee in Knoxville – consists of the most powerful computers around. Although Japan's Fujitsu K supercomputer housed in Japan's RIKEN research laboratories is in top spot, work is already underway on Titan – which will use Nvidia's chips (something that was given prominence in the chip giant's recent financial results) – and should overhaul it by some way. The UK has seven supercomputers that make the list, although those machines are across only four different sites. They are the University of Edinburgh's impressive Cray XE6, Opteron 6276 16C 2.30 GHz, Cray Gemini interconnect, which sits proudly in 19th place in the rankings, the European Centre for Medium-Range Weather Forecasts which offers up the 55th ranking computer along with the 99th and the 100th, the UK's Met Office who provide the 62nd and 63rd ranking machines and the Atomic Weapons Establishment (AWE) which holds 93rd spot. China's Tianjin-based National Supercomputing Centre holds second spot, with the United States' Oak Ridge in third. Another Chinese national Supercomputing Centre – this time in Shenzen – takes fourth spot and the top five is rounded out by Japan's GSIC Center Toky Institute of Technology. The highest European entry is in ninth spot and is France's Commissariat à L'énergie Atomique (Atomic Energy and Alternative Energies Commission).